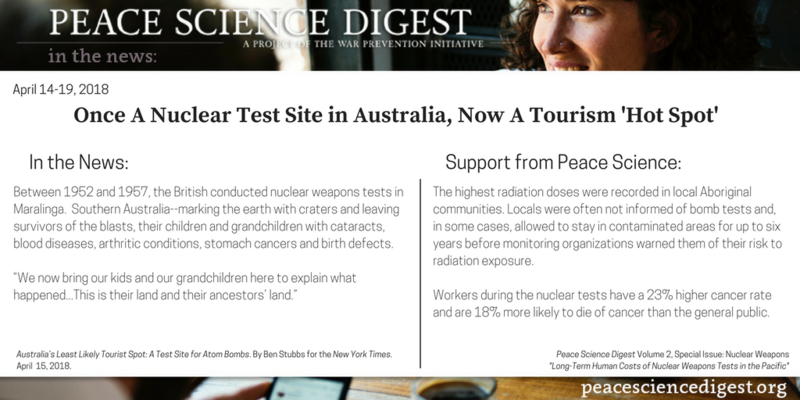 A former nuclear test site in Australia is now a growing tourist attraction. Though, few know about the devastating, long-term, consequences the test had on the nearby indigenous population and test workers. “Maralinga, Australia, a barren stretch of land in South Australia’s remote western desert, is the country’s only former nuclear test site open to tourists. ‘Yes, there is still radiation here,’ Mr. Matthews said as he drove a minibus to the sites where the Australian and British governments dropped seven bombs between 1956 and 1963, which dotted the earth with huge craters and poisoned scores of Indigenous people and their descendants. Back then, the government placed hundreds of human guinea pigs — wearing only shorts and long socks — in the front areas of the test zones. The effects of large doses of radiation were devastating”. Australia’s Least Likely Tourist Spot: A Test Site for Atom Bombs. By Ben Stubbs for the New York Times. April 15, 2018.